Interspire Shopping cart is an award winning and awesome software to power your online store. Though the platform is excellent and powers over 100000 online stores, it lacks the multi language feature. There has been a long waiting from the vast customer base for an addition to Interspire shopping cart to enable it to work with multiple languages. Finally, we have come up with a solution-derived from our vast experience with the ecommerce industry, specifically with the interspire platform. 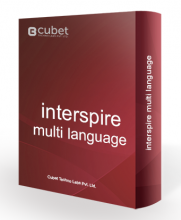 This addon for interspire will enable us to integrate multiple languages into our interspire powered shopping cart. We will be able to place language options on the page for users to choose between different languages as shown in the above image. Below are some of the key features that makes this multi language addon a must for your interspire shopping cart. Excellent 24×7 support over email/forum. Click the button below to add the Interspire Multi Language to your wish list.